SUNSET, OR A NEW SUNRISE? Brazil faces a monumental challenge in meeting the expectations of its citizens, corporations and global investors over the next several years, as the nation invests heavily to host the World Cup and the Olympics. No one can deny that Brazil is living up to its reputation as the world’s second-largest emerging economy after China. The country is making strides to address structural issues that have held back growth and is investing heavily in infrastructure for the major sporting events it is hosting next year and in 2016, the World Cup of soccer and the Summer Olympics, respectively. But the populace has not been impressed by the reforms, and the administration has been hard pressed to quell massive public protests that began in June. 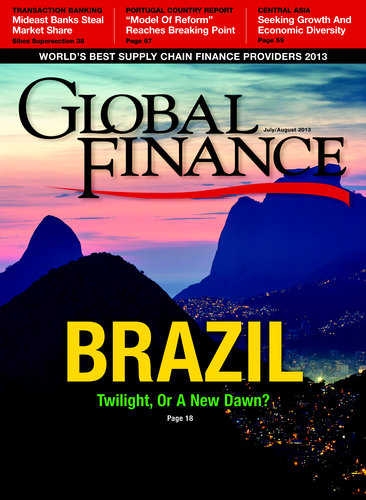 As the magazine was going to press, president Dilma Rousseff had announced a referendum on a new set of reforms, including heavy investment in education, healthcare and public transport infrastructure, new guidelines governing fiscal responsibility and the establishment of a constituent assembly to ensure reforms are implemented. 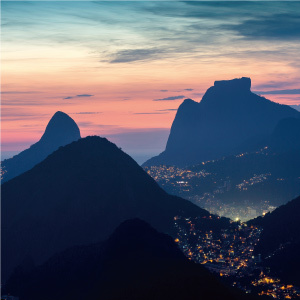 Despite the unrest, investors are keen on Brazil. In the world’s biggest corporate bond issues this year, two international finance units of national oil firm Petrobras raised $24 billion, according to data provider Dealogic. In the world’s biggest IPO this year, BB Seguridade Participacoes, the insurance arm of Banco do Brasil, raised $5 billion on the São Paulo Stock Exchange in April. While bankers were still buzzing about how heavily oversubscribed those deals had been, 39 international oil companies paid a record $1.4 billion for 142 offshore exploration blocks and committed to invest another $3.3 billion in Brazil’s biggest auction of oil drilling rights in five years. According to international bankers, this display of insatiable demand for Brazilian assets shows renewed confidence in an economy that grew by only 0.9%, or less than one-third of the government’s target rate, in 2012. “Coming off a difficult year, the confidence of investors in the Brazilian economy and the Brazilian investment environment in general has definitely improved,” says Michael Kalavritinos, head of global client management at BNY Mellon in Brazil. As host of the World Cup of soccer in 2014 and the Summer Olympics in 2016—two of the world’s most closely watched sporting events—the government is spending generously on infrastructure in the expectation of a windfall in revenues. Next year’s World Cup is already the most lucrative on record, having exceeded the $3.8 billion in revenues from broadcasting rights and other revenues disclosed by FIFA, the international soccer association. In 2016 the Olympics are expected to generate about $6 billion in revenue. In preparation for these events, the government is investing strongly in infrastructure projects, starting with $21 billion to upgrade stadiums, roads, ports, airports and other infrastructure for the World Cup in a dozen Brazilian cities. Next, it’s planning another $7 billion on similar projects for the Olympics in Rio de Janeiro. In addition, the government is in the midst of a program to spend $526 billion on other infrastructure projects ranging from power plants to sewer systems to housing complexes by the end of next year. Rousseff sanctioned a new law in early June to privatize Brazil’s Atlantic and Pacific seaports in the hope of generating $26.6 billion in private investment, which Brazilian bankers expect to materialize sometime around 2016. The question is whether Brazil’s economy will benefit after the expected 600,000 foreign tourists leave Brazil as the World Cup concludes, and about twice as many return home after the Olympics. For the infrastructure investments to pay off, they must be well planned. Such concerns drove thousands of Brazilian protesters onto the streets of São Paulo and several other cities in June with demands that public funds be spent on health and education instead of football stadiums. Bankers point out that the London Olympics of 2012 were preceded by years of planning that resulted in more efficient rail links and other infrastructure improvements that will benefit the British economy over the long term. But investments for the Athens Olympics in 2004 were characterized by quick fixes that went unnoticed thereafter. “Rio de Janeiro is not going to be like London. It’s going to be more like Athens,” says Andres Garcia-Amaya, a global market strategist at JP Morgan Asset Management in New York. There are also concerns about the extent to which Rousseff’s populist policies will drive a sustained recovery of Brazil’s stock market. The Ibovespa Brasil São Paulo Stock Exchange Index fell by 17% from January 2, when it had peaked at a nine-month high, to April 17. Although the sheer size of the BB Seguridade IPO helped drive the index up 6.8% in May, the index fell back down near its April low by the end of the month. A possible drag on the stock market came in March 12 when Rousseff’s government announced that electricity prices will fall by 20% despite protests from electrical utilities that their profits would fall. “If you are an investor, that really makes you think twice about participating in the market there,” says Garcia-Amaya. Engineering giants like General Electric of the US and Siemens of Germany—the latter having reportedly signed $1.3 billion in World Cup infrastructure contracts—are suppliers to Brazil’s export-oriented iron-ore and oil industries, which dominate the economy. But they are also among the many companies that are banking on steady growth in consumer spending in this country of 197 million people. Among the country’s fastest-growing industries are IT and telecoms, which are recovering with a vengeance from a ban on computer imports from 1977 to the early 1990s. According to a study by McKinsey & Co, those sectors combined will increase from 5.2% of GDP last year to 8% in 2022 as the market more than doubles in size from $123 billion to $253.5 billion. By 2022, IT and telecoms exports are expected to increase nearly seven-fold, from just $3 billion to $20 billion. One driver of such growth has been multimillion-dollar start-up loans for tech entrepreneurs from the Brazilian Development Bank, says Luciano Coutinho, its president. Not by coincidence, the largest foreign direct investor in the country is Telefónica. After the Spanish telecoms company acquired the 50% stake in Brazilcel that it did not already own from Portugal Telecom for $9.5 billion in May 2010, Telefónica embarked on a four-year, $11.4 billion investment program driven by a wave of soccer cheerleading. In April and May, Telefónica installed Brazil’s second 4G wireless smartphone network in 15 cities, including six cities that hosted the Confederation Cup—another soccer tournament—in June, and Rio, which will play host to both World Cup and Olympic events. Even the renovation of stadiums has presented an opportunity for some foreign companies. Anschutz Entertainment Group of Los Angeles holds a 5% stake in a consortium led by Odebrecht Organisation, a Brazilian engineering conglomerate, which won a 35-year contract to manage the colossal Maracanã Stadium in Rio de Janeiro. The consortium is expected to invest about $297 million to build, among other things, two sports museums (one devoted to soccer and the other to the Olympics). A legal challenge to the contract—an example of what Cunningham calls “a high level of bureaucracy” in Brazil—was struck down on May 15 by Rio’s Court of Justice. Yet while this complex Amazon nation makes progress in some areas, it regresses in others. Earlier this year, mining exports—a key driver of Latin America’s largest economy—fell, owing to slack demand from China, where economic growth is slowing down. Such concerns go a long way toward explaining the existence of import tariffs, which, despite reductions on more than 100 items announced in January, are still regarded as high. As a result, some economists argue, Brazil’s industries have become uncompetitive and the current account deficit stands at $8 billion with inflation at about 6.3%. Depending on the extent to which Brazil’s economy opens further to the outside world or attempts to protect itself from global economic ills, and depending on the extent to which Brazil succeeds in sustaining a steady flow of investment and maximizing productivity, Brazil’s economy could thrive, just muddle through or perhaps go the way of Greece in a range of three scenarios (see sidebars). Ultimately, Goldfajn expects Brazil to open its economy further to the rest of the world, either to maintain a high GDP growth rate or to pull it out of a decline, depending on whose projections you believe. 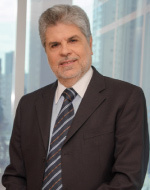 Carlos Langoni, a former governor of Brazil’s central bank, says he expects Brazil to whittle away at tariffs and capital controls by negotiating new bilateral free-trade agreements with the US and several other countries in the years to come. In a glimpse of what such reforms could look like, the government reduced both its 6% IOF (financial transactions tax) on foreign investment in domestic bonds and its 1% tax on currency derivatives to 0%—capital controls that had been intended to keep the real competitive with foreign currencies—in moves that Finance minister Guido Mantega indicated was intended to encourage more foreign investment. 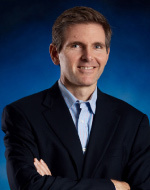 Next, Kalavritinos expects Roberto Azevedo, a Brazilian career diplomat who was elected head of the World Trade Organization on May 7, to drive such a free-trade agenda at home. Such predictions can only bode well for Brazil’s long-term future. In a best-case scenario, an economic recovery that began to take shape with 2.2% GDP growth for the 12 months through March 31 would build momentum. If investment increases from its currently low level of 19% of GDP to at least 21%, the economy could grow by about 4% a year for four or five years and unemployment would fall from the current 5.7% to as low as 4%. This scenario assumes that multinational corporations issue tax-free bonds to finance infrastructure projects and that seaports are privatized as planned. It also assumes that capital controls are eventually lifted to allow capital to flow freely into the country. A base-case scenario for Brazil’s economy envisions GDP growth leveling off at about 3% a year for several years, which would be enough to absorb workers entering the job market. If foreign direct investment continues to roll in at about $5 billion every month as it did last year, the current account deficit should remain at its present level of $8 billion. The government would finish renovating the stadiums, but not all the planned infrastructure projects would be completed within five years. Brazil would continue to struggle with a currently high 7.25% Selic interest rate and 6.3% inflation, both of which are dampers on growth. In a worst-case scenario, GDP growth would fall in a double dip, to 2% or even 1% a year, ramping unemployment up to 7% or 8%, predicts Ilan Goldfajn, chief economist at Itaú Unibanco. This would be the result of the government’s failing to attract as much foreign investment as expected in infrastructure—especially in transport-related projects, most likely owing to a reluctance to remove capital controls. The government would resort to temporary measures to prepare for the Word Cup and the Olympics, such as declaring a national holiday for civil servants to take pressure off public transportation. The government would dip into its reserves of $378 billion to resume the projects in 2017 and, ultimately, be forced to lower trade barriers.